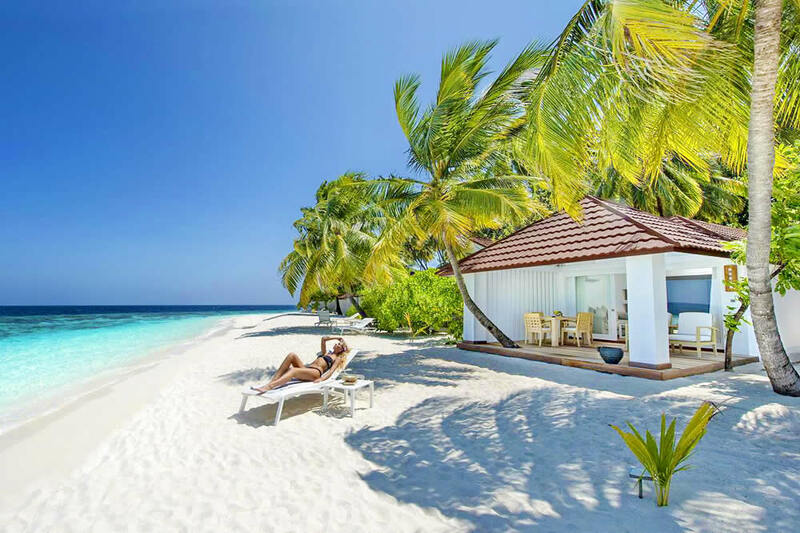 With chic and white water villas, Diamonds Thudufushi is the twin island to Athuruga in terms of resort design, number of rooms and island size and geography. Small and picturesque, Thudufushi offers a naturally unspoilt and wonderfully informal island hideaway perfect for diving and watersports. Expect welcoming staff and a lovely casual atmosphere here, and also excellent dining options and some of the best snorkeling in the archipelago. 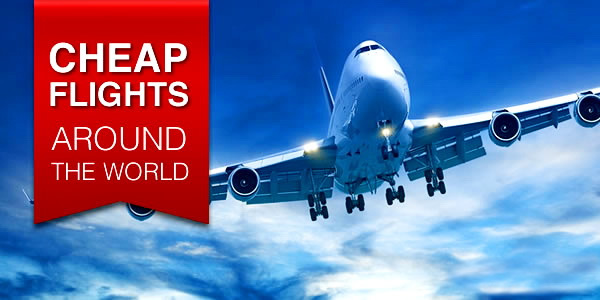 The resort is a 35-minute seaplane jorney from Male airport. Built in 1990, and Italian-owned Diamonds Thudufushi does an impressive job to hide his age. Like its sister property, it has a simple (but upscale) completely white decor and, although perhaps the TV lounge needs a little update, the overall look is very well maintained. Although the resort does not have a Children's Club, and there are only a few concessions for children, this is a clearly good place for a family vacation. All the staff are helpful, and all the guests are friendly and at ease. There is no expression of disapproval, no one frowns, but rather smiles and supports to join. Because the island is small, the buildings are simply located, the staff are sympathetic and diligent (and everywhere there is sand), small children can wander all over the island barefoot all day. For teens there are canoes, windsurfing and laser, or billiards, table tennis and darts (free food and drinks all day). The resort has recently had a makeover but coral walls still feature throughout. 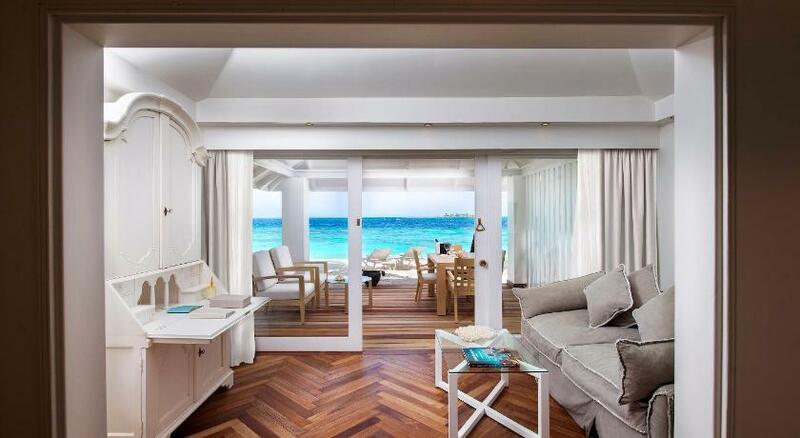 The re-designed water villas have an airy and uplifting feel. Located in the central pavilion area just off the lobby you'll find most of the resort's extra features, like a medical clinic, dive shop, gym, and large souvenir boutique. There's also a non-atmospheric TV room with a flat-screen TV (and limited channels), internet station, Wii, couches, and lending library. The tiny fitnss room will disappoint most gym rats with its tiny dimensions and limited features -- just a singular treadmill, well-used yoga mat, free weights, and two machines. Next door there's a breezy game room with foosball and a smaller-than-regulation pool table. Thudufuhsi is located on a small private island in South Ari Atoll, and has a large lagoon with a vibrant house reef. The island’s location on the outer edge of the atoll means that there’s access to deeper ocean and larger marine creatures. Thudufuhsi is 30 minutes by seaplane from Male airport, and 15 kilometers south of Athuruga. 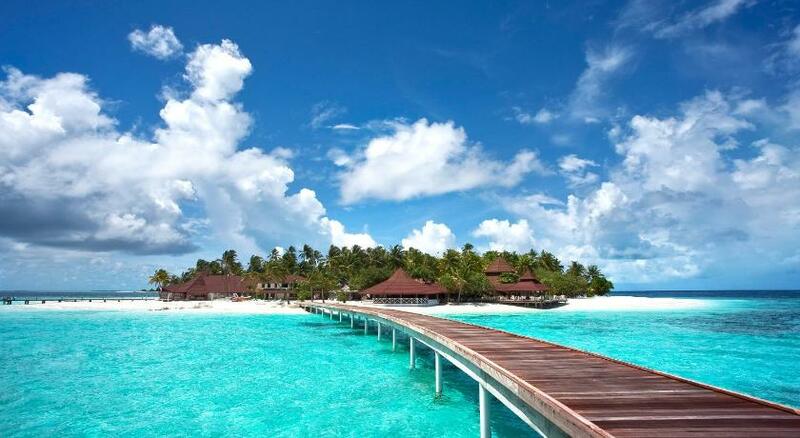 Diamonds Thudufushi is an island that really takes your breath away. When you arrive off the seaplane it feels like you have landed in paradise; the sea is bright turquoise against the powder white sand and bright white contemporary water villas. As at Athuruga, the beautiful five-star Water Villas are stylish white residences, and here they have an open wooden deck built on stilts over the water. The water villas offer something very different to other islands as they are Italian in design and very private and spread out from the surrounding villas – perfect for a tranquil oasis of calm or a dream honeymoon! With custom-made rattan furniture, hand-made parquet floors, contemporary Italian lighting and benefits including iMacs and free Wi-Fi, these villas have a real 'wow' factor. Here you’ll also be able to choose between sunset or sunrise views and to snorkel with a turtles in their natural habitat around the reef – something you will never forget.Water Villa guests have access to their own restaurant, Thari, with a modern European and Asian fusion à la carte menu. 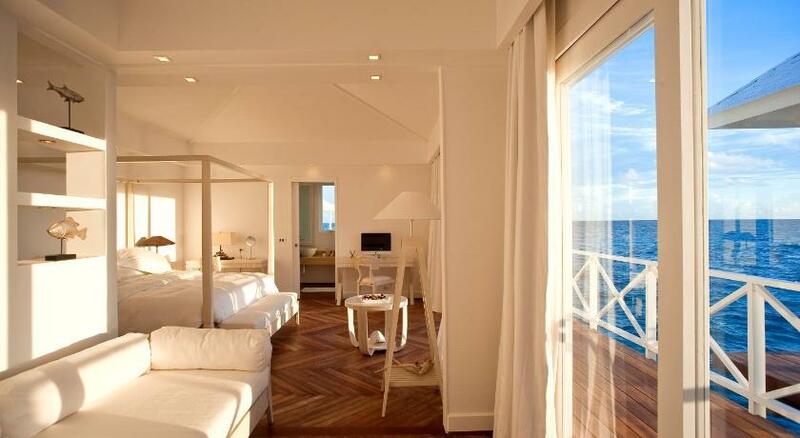 All 72 Thudufushi's rooms have beautiful, unprocessed wooden floors, simple white furniture, and double beds. Standard rooms are equipped with a minibar, tea / coffee making facilities, life jackets, a hairdryer, iPod dock station, umbrellas and a private outdoor seating area with ocean views. In some rooms the floors are made like a parquet and modern, in the form of tortoise shell, lampshades. All bathrooms have bidets, bathrobes, rain showerheads, and organic Ayurvedic toilettes products, but surprisingly without air conditioning or a cosmetic mirror. Beach bungalows are scattered right on the beach. This arrangement significantly reduces privacy, but you have creamy white sand and "sapphire" lagoon views on your doorstep just a few meters from the room. 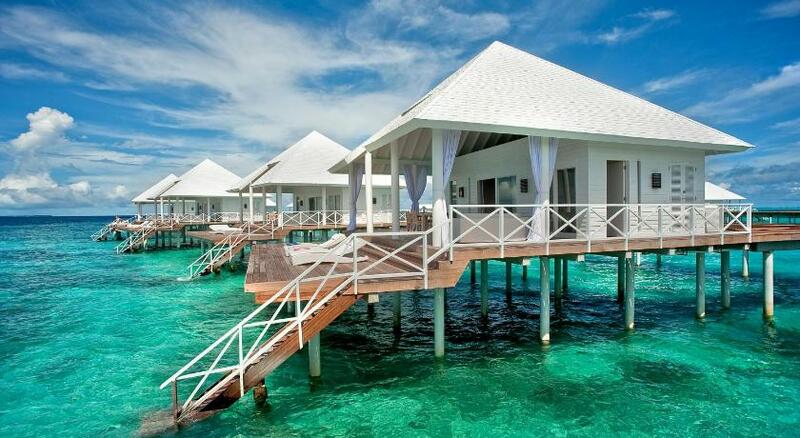 For private life, we recommend taking water villas. Beach Bungalows and Junior Suites have fully outdoor bathrooms with bowl sinks and stylishly rustic privacy walls made from rough coral stones and cement. These rooms also have their own personal beachfront decks with contemporary furniture and sets of loungers in the sand. Upgrading to a Water Villa gets you a la carte dining, direct access to the sea via a ladder on the deck, alcohol in the minibar , and a personal iMac computers but you lose the outdoor shower and sand at your door that other rooms have; some Water Villas also have whirlpool tubs . The property's four Water Villa Suites are paired off into separated units that share an infinity pool and large deck with personal couches and loungers. Exclusive Spa Beach Bungalow includes the benefit of 1 spa treatment per room per day included at the Serena Spa (from a choice of: serenity full body aromatherapy massage, anti-stress head, neck & shoulder massage, aromatherapy back massage, padabhyanga foot & leg massage and sports massage). For such an island, the beach is not very beautiful. Although there is a wide strip of sand in front of beach bungalows and junior suites, the public beach is more stripped. Located between the arrival dock and the long water villas jetty, the soft sands accommodate just a few wide white wicker chaise lounges and a volleyball net. As on many islands, the tide comes with the sun, and the beach decreases. The food is excellent. The emphasis is on Italian dishes, with a daily pizza, pasta and grill stations, but the main buffet is changed every day to reflect the national cuisine and satisfy the tastes of all guests. Eastern nights, by the way, are not the most convincing. However, the Maldivian night is an unforgettable part of the culinary adventure: at Farivalhu restaurant a table and chairs all covered with white tablecloths, under palm trees and lit by flashlights, and waiters in a full traditional dress and guests in sarongs. Tidbits and delicious snacks can be put on the tooth during the day at the main and beach bars. Dining options include the buffet-style restaurant, Maakanaa, plus an intimate Thila Japanese restaurant with a teppanyaki grill and a cultural Maldivian corner, where two guests at a time can prepare traditional dishes with the chef and then dine under the palms of the tropical garden. From January to April, the resort also hosts the ‘Dining with the Stars’ experience, featuring a different chef each week from the renowned Jeunes Restaurateurs d’Europe who will host a cooking lesson and gala dinner. Rooms on the beach include cottage-style Beach Bungalows scattered around the island on the beachfront and Junior Suites with a separate living room. 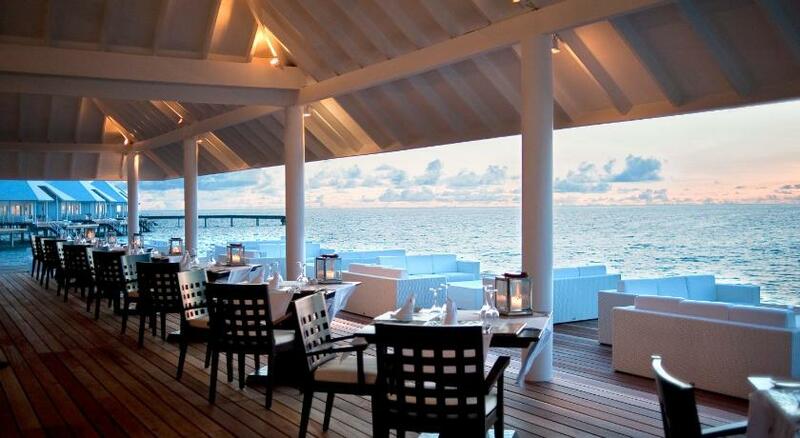 The main dining venue for Water Villa guests is Aqua – the overwater restaurant which features a modern European and Asian fusion à la carte menu and is perfectly situated for sunset cocktails. The restaurant is open to Water Villa guests, but those staying in Beach Bungalows have to make reservations beforehand for an extra charge. Outside of the bar service inside the resort's two restaurants, Thudufushi has another main bar. Veli – a beach bar serving up light bites and tropical cocktails is in an open beautiful palapa, near the sea; in a smooth modern style, a completely white bar with stools on one side, and several black and white couches. A casual, simple, and elegant place gives views of the beach and the sea horizon and is open from morning until late evening. The list of drinks of the bar offers a good selection of cocktails, moktails, hot teas, and international wines and spirits. Bridal booze and premium wines go for an extral fee, although the all-inclusive plan includes a great drinks, international wines to choose from, and Lion draft beer from Sri Lanka. For a romantic dinner on the beach, Faru offers freshly caught seafood and fresh lobster under the moonlight. As part of the Maldives night, there is quite an impressive show of Bodu Beru, which attracts a significant part of the audience, with a tide of fun and laughter. Every evening there must be something, in a small theater between the main bar and the restaurant. But this is mild animation, including evening films, quiz nights, karaoke and astronomy. For those who want a hotter night, they usually dance on the night after the animation ends. And the bar remains open until the last guest. • Wi-Fi in the Water Villas. NB – Beach Bungalow guests can dine at the overwater restaurant, Aqua, and ‘Dining with the Stars' gala dinner at a supplement. 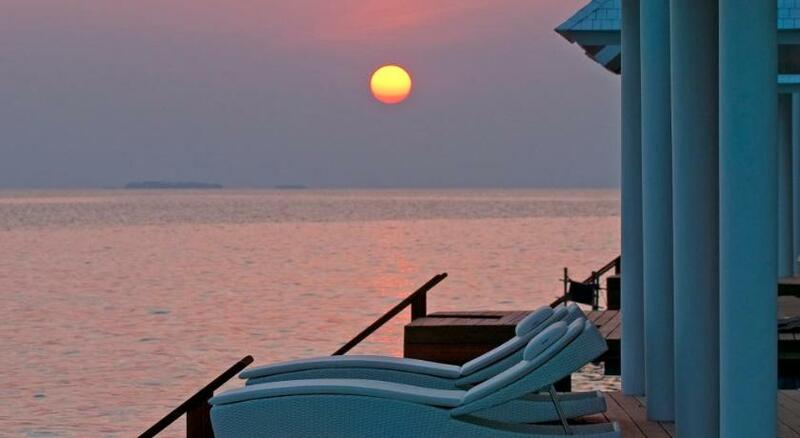 Like most resorts in the Maldives, life at the Thudufushi is slow and dreamy — as it should be. Diving is one of the most popular activities here. The island's location on the outer edge of the atoll means that there's access to deeper ocean and larger marine creatures. There's a great area for waterskiing and windsurfing, a large lagoon and house reef, and an impressive marine biology programme includes coral regeneration. Otherwise, the only reason to leave the resort is to visit the nearest island to glimpse Maldivian daily life, a trip that’s optional and included in your stay. The beachfront watersports center has all the usual activities and gear from snorkeling to canoeing, plus a few extras like wakeboarding. Some of the more unique features include an on-site tailor and a dedicated Fishing Club that gives guests opportunities to cast a line, be it deep-sea or during sunset. For those who want to cash in on relaxation, there’s a garden-set Serene Spa with rustic vibe and Ayurvedic treatments where you’ll find thatched doors, open-air hut treatment rooms with large but basic showers, and small nail care room with an open fourth wall. Reviews of the Diamonds Thudufushi Beach & Water Villas are excellent, with guests being particularly impressed by the huge rooms and the giant beds and luxurious bedding. The attentive staff also get very high marks from nearly everyone, with each room assigned a room boy to make sure everything is stocked up properly. The food receives high marks as well, which isn't true at all all-inclusive resorts where everything is one price. The location and the house reef are also well regarded and any problems reported are generally minor and dealt with swiftly. 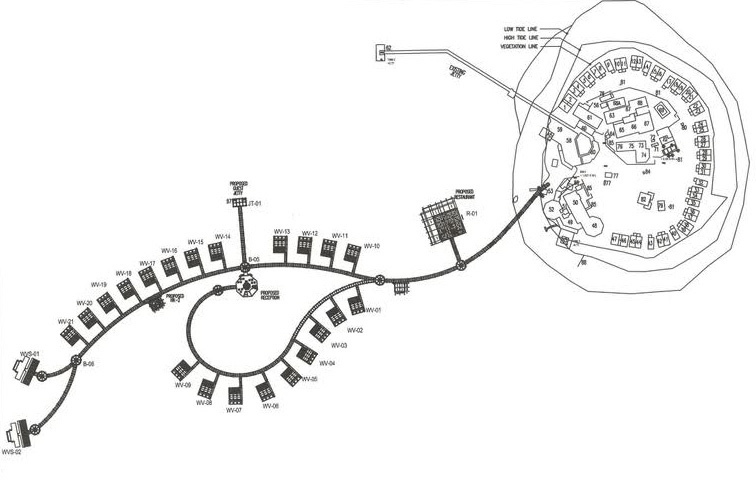 All in all, this seems to be a great resort option that will allow for both relaxation and sea adventures.